You're assuming God needs to interfere; why? God has no obligation to interfere within the affairs of men, even in vices. If he does, he denies free will to that person committing the crime. Thus, on judgment day, Hitler would be questioned as to why he did this and that, and Hitler can argue that he didn't have complete free will. Without free will, there is no test. And to those comparing the holocaust to the Pharaoh: remember, the Pharaoh DID persecute the children of Israel. God didn't stop him from starting the persecution, but he let Moses free them from the persecution. In the same way that the holocaust did happen, and a finite force (the allied forces) stopped it. Not to say that the allied forces are prophets in any way. Any man, be it Moses or Dr. Who has the capability to stop evil. Moses isn't God, he doesn't have infinite power, he had to struggle to stop the Pharaoh. You are posting as if I've stated that morality defined without religion is perfect. Saddam was a Muslim, Bin laden a Muslim, Shia's being slaughtered by Muslims in Pakistan, Jews in Israel murdering Palestinians, all these culprits justified these murders using a religion defined moral code. Religious folks and non-religious folks are on the same boat. Both parties define morality subjectively and act upon it, both parties killed. Religion is not represented by its followers. To help you understand, here's an example: Lets say a man named Yahya the Bartender, for whatever reason, killed another man in your name. However, you didn't want him to kill that man. By your argument, you were responsible for the death because the person claimed he followed you. The reality is, you are not responsible because that person does not represent you. The only person that represents you is you. Likewise, the only person, thing, or idea that represents a religion is the religion itself, i.e. the actual scriptures, laws, and sources of that religion. To challenge the morality of a religion like Islam, you must challenge the Quran, accepted Sharia Law, and the primary sources of the religion, i.e the Prophet and Imams (as). You cannot challenge Islam through the moral behavior of Saddam Hussein, Osama bin Ladin, or Yahya the Bartender, because they don't represent Islam. You say not to kill, Yahya the Bartender kills, therefore Yahya the Bartender is not following you. No matter what Yahya the Bartender says or does to justify the murder, his actions will never represent you. Islam says to not kill, Saddam killed, therefore Saddam is not following Islam. No matter what Saddam says or does to justify the murder, his actions will never represent Islam. Despite crippling US sanctions imposed on Iran, the Pentagon has purchased 115 $310 vials of antivenin from the Islamic Republic to treat Americans who were bitten by deadly snakes in Afghanistan. The US military has grown increasingly dependent on the antivenin to treat bites by Oxus cobras, which is a highly venomous snake whose bite can completely paralyze its victim in less than an hour. In most cases, those who are left untreated after such a cobra bite do not survive. The antivenin is also used to treat bites by Haly’s pit vipers and other snakes that are found in southwest Asia. “When biting they hold on and chew savagely,” the Army Public Health Service warns about the Oxus cobra. If any of the 13 species of venomous snakes found in Afghanistan bites a soldier who can’t identify the snake, then they are given the Razi antivenin. But although lives depend on the Razi Vaccine & Serum Research Institute, US military purchases from the Iranian establishment may be in violation of sanction rules. Such purchases legally require a waiver from the US Treasury Department. The Pentagon is investigating the purchases after the Wall Street Journal raised questions about its potential sanction violations. With $35,650 spent on the antivenin vials since January 2011, the US has been a significant customer for the Iranian institute, mainly because suppliers are few. US Food and Drug Administration-approved antivenin is ineffective on Afghan snake bites because the drugs only treat bites by snakes found in the US. Researchers at the Razi Vaccine & Serum Research Institute say that regardless of sanctions, they will sell the drugs to anyone who needs them. “We make this to save lives, and it doesn’t matter if the person is Iranian or Afghan or American. We are happy to hear we have saved a person’s life, even an American soldier,” said Hadi Zareh, lead researcher in the antivenin department, in an interview with the Journal. Still, the institute has not remained unaffected by sanctions: the rules have made it difficult for researchers to acquire the necessary resources to make the antivenin. Chemical products and equipment have become scarce and expensive, which in the long run could have a significant effect on the supply of the much-needed and life-saving antivenin. Razi has researched and produced vaccines since 1924. The organization makes about 95,000 vials of the snake antivenin each year and is currently researching antidotes for spider bites. Razi injects the venom into one of its 200 horses, waits for the animal to produce antibodies and then uses that to make the antivenin. “The Iranian antivenin is the best, and our guys deserve the best,” Col. Rob Russell, medical director at Camp Bastion hospital in Afghanistan, told the Wall Street Journal. I believe that morality through concepts alone is flawed. There's no binding that can chain you to a concept. Religion chains you to morality out of fear of Hell. Likewise, state laws chain you to morality through the fear of legal consequences. To organize and follow a concept of morality, there must be fear of punishment in its transgression. Otherwise it would be too unstable. Even if someone without any religious faith creates a perfect moral system for himself and forces himself to follow it, it still is unstable. To violate your moral beliefs believing that no one will judge you for it is too easy. Belief in religion is a much more powerful chain, since there are no loopholes. You do an immoral action, you will be punished. In the material world, a person who commits a crime must undergo a fallible process and still has a chance to escape from punishment, or be punished for a crime he did not commit. In a divine court, such things are impossible. Every action you commit is questioned and every sin you commit, no matter how small, will be accounted for. If one truly believes in a religion, he assumes a powerful chain on himself that no law or system can create. The only question is the moral system itself and not the effectiveness of it. can someone join the police or military of their respective country? haram especially when it is mobilised against Muslims or an Islamic state. The novel takes place in industrial era Russia. Toddlers used to clean chimneys and people were in desperate survival mode. So in this context it's odd that someone would not sympathize with the character. Its a completely diffrent setting, so judging through Islamic principles seems unfair. Are you in college or high school. That's somewhat the root of the question. My professor, who has taught many Muslim students this book, has gotten the impression that Islam views the character negatively (i.e. what she did was haram). My English class has been analysing Fyodor Dostoyevsky's translated novel Crime and Punishment. My professor has asked of me and a few fellow Muslim classmates to form an opinion of the character Sonya in the book. He was very specific, questioning the moral stance of Islam on the occupation of Sonya (a prostitute). He feels that Muslims in his experience teaching the novel have felt she is not the sympathetic character Dostoyevsky presents her as. I would like to seek the opinion of my Muslim brothers and sisters about Sonya. For your class, try the question: "why does everyone who goes into politics has to have "working class" roots or jobs?" Kind of reminds me of Mao and other Commies. Tradesmen make good money but not as much as the professions. And unskilled truckers make more than a lot of people. Who do you want in the Oval Office? Joe Six-Pack ? I think the point of the article was to bring about the point that white collar workers can't represent the blue collar majority simply because they lack the knowledge and experience of said white collar workers. Basically, majority should not be represented by minority. As for the other comments; they're somewhat irrelevant to the topic. I don't disagree, but it doesn't exactly try to analyse/refute the article. The video was funny though. I'm supposed to read and analyse this article for my Political Science class. I just wanted to see the opinion of SC on it. ELECTIONS are supposed to give us choices. We can reward incumbents or we can throw the bums out. We can choose Republicans or Democrats. We can choose conservative policies or progressive ones. In most elections, however, we don’t get a say in something important: whether we’re governed by the rich. By Election Day, that choice has usually been made for us. Would you like to be represented by a millionaire lawyer or a millionaire businessman? Even in our great democracy, we rarely have the option to put someone in office who isn’t part of the elite. Of course, many white-collar candidates care deeply about working-class Americans, those who earn a living in manual labor or service-industry jobs. Many are only a generation or two removed from relatives who worked in those fields. But why do so few elections feature candidates who have worked in blue-collar jobs themselves, at least for part of their lives? The working class is the backbone of our society, a majority of our labor force and 90 million people strong. Could it really be that not one former blue-collar worker is qualified to be president? My research examines how the shortage of working-class people in public office affects our democracy and why there are so few former blue-collar workers in government in the first place. The data I’ve studied suggest that the working class itself probably isn’t the problem. It’s true that workers tend to score a little lower on standard measures of political knowledge and civic engagement. But there are many more workers than there are, say, lawyers — so many more, in fact, that there are probably more blue-collar Americans with the qualities we might want in our candidates than there are lawyers with those traits. If even only half a percent of blue-collar workers have what it takes to govern, there would still be enough of them to fill every seat in Congress and in every state legislature more than 40 times — with enough left over to run thousands of City Councils. Something other than qualifications seems to be screening out people with serious experience in the working class long before Election Day. Scholars haven’t yet confirmed exactly what that is. (Campaign money? Free time? Party gatekeepers?) But we’re starting to appreciate the seriousness of the problem. And these trends don’t stop at the federal level. Since the 1980s, the number of state legislators whose primary occupations are working-class jobs has fallen from 5 percent to 3 percent. 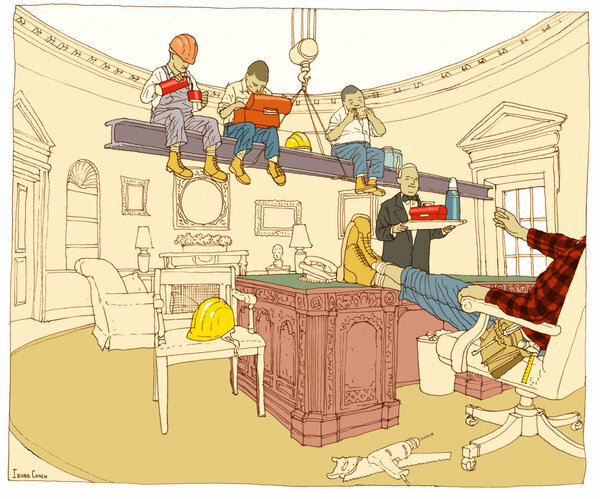 In City Councils, fewer than 10 percent of members have blue-collar day jobs. Everywhere we look in government, almost no one with personal experience in working-class jobs has a seat at the table. Former house painters are the exception in Congress, of course. And although there are many white-collar lawmakers with good intentions, with so few leaders with experience in working-class jobs (from 1999 to 2008, the average member of Congress had spent 1.5 percent of his or her adult life in working-class jobs), economic policy routinely tilts toward outcomes that help white-collar professionals at the expense of the working class. Social safety net programs are stingier, business regulations are flimsier, tax policies are more regressive, and protections for workers are weaker than they would be if our lawmakers came from the same mix of classes as the people they represent. The key is finding more lawmakers like Mr. Beard, politically adept working-class Americans. Or people like Representative Stephen Lynch, who worked as an ironworker in Boston for nearly two decades before attending law school and becoming a legal advocate for workers — politicians who worked their way up to white-collar jobs but who still remember what it’s like to push a broom. My experience suggests that finding them will be the easy part. The hard part will be persuading the people with resources to help them. Many political gatekeepers still cling to myths about how there’s something “the matter with Kansas,” how workers are too backward to know what’s best for themselves politically. And people who value political equality already have their hands full with big challenges: mainly, the explosion of money and interest groups in Washington, and the large social class gaps in routine forms of political participation, including voting. Even if we somehow stem the tide of money in Washington, even if we guarantee equal participation on Election Day, millionaires will still get to set the tax rate for millionaires. White-collar professionals will still get to set the minimum wage for blue-collar workers. People who have always had health insurance will still get to decide whether to help people without it. If we want government for the people, we’ve got to start working toward government by the people. The 2012 election offers us a stark choice between two very different approaches to economic policy. But it’s still a choice between two Harvard-educated millionaires. Even in an election that is supposed to be about the future of our economy, we don’t have a working-class option in the voting booth. It’s time for citizens who care about political equality to start investing in working-class candidates. We know how to do this. In 1945, the House and the Senate were each 98 percent men. In the decades since, party leaders and interest groups have deliberately recruited many female candidates, and today women make up 17 percent of Congress. If the old boys’ club isn’t invincible, the Millionaires Party probably isn’t, either. Changes like these aren’t rocket science. They just take a little hard work. Making a U-turn, Argentinean President Cristina Kirchner has announced she is now willing to talk to Iran, a country she accuses of master-minding the worst ever terror bombing on Argentine soil 18 years ago. ­Immediately, Argentine Foreign Minister Héctor Timerman met with his Iranian counterpart Ali Akbar Salehi with the explicit goal of “reaching the truth”. Zionists outcries over Argentina’s decision were immediately voiced. From Assistant US Secretary of State Roberta Jackson who warned that “relations with Iran are never benign”; to the presidents of the local DAIA (Argentine Delegation of Israeli Associations) Aldo Donzis, and AMIA (Argentine Israeli Mutual Association) Guillermo Bolger, who said Iran’s proposal to talk “are disrespectful and offend Argentina’s judiciary system”, as “Iran cannot be trusted”, and the Israeli government which condemned the meeting of foreign ministers even before it took place. The truth is that eighteen years after a powerful bomb destroyed AMIA headquarters on July 18, 1994 killing 86 and injuring over 200, the case remains unsolved and the guilty were never brought to justice. From the very day of the attack, the “AMIA Case” has suffered flagrant interference from the US and Israeli governments. Then Argentine President Carlos Menem – who once boasted that Argentina and the US enjoy “carnal relations” – gave US and Israeli intelligence agencies FBI and Mossad unrestricted access and overriding involvement in the investigations into this attack. In fact, it was an Israeli military intelligence officer who discovered in the rubble at AMIA’s ground zero a small piece of metal belonging to the engine of a van which “luckily” (for the Israelis) carried the manufacturer’s serial number and could thus be traced back to an alleged “car-bomb”, even though no other pieces of that vehicle were ever found, nor were there credible witnesses who can say they ever saw the van. As the years went by, the AMIA Case went through seven federal courts in Argentina and became drenched in lies, corruption and cover-ups. After erratically starting off in different directions, today Argentina’s Kirchner government formally accused the Islamic Republic of Iran of masterminding the attack. Naturally, the US and Israel have great interest in making such accusations prosper as that would add further “evidence” of Iran being a rogue state ripe for unilateral Western military attack. Especially, at a time when US and Israeli credibility in the growing Iran nuclear program crisis reaches new lows, “proof of Iranian guilt” in the AMIA bombing would be a God-send. The AMIA Case is plagued by judicial and diplomatic corruption. An example refers to the impeachment of federal judge Jorge Galeano who authorized paying a $400,000 bribe to Carlos Telleldín, a jailed stolen car dealer, so that he would provide false evidence supporting an “Iranian and Syrian Link” to this attack. The bribe was funded by local banker Rubén Beraja, at the time president of DAIA and owner of the local Banco Mayo bank which would later collapse, landing Mr Beraja in jail for several years. In the nineties, however, Mr Beraja was a prestigious figure in International Zionist circles, being invited by former FED Governor Paul Volcker to join his “Commission of Notable Persons” investigating old dormant Jewish accounts in Switzerland, which led to Swiss banks having to cough up 1.25 billion dollars to global Zionist organizations. Another milestone took place on September 21, 2006 when President Néstor Kirchner together with his Foreign Minister Jorge Taiana and first lady and then Senator Cristina Kirchner, held a closed-door meeting in New York’s Waldorf-Astoria Hotel with eight key international Zionist organizations, notably, the American Jewish Congress, World Jewish Congress, B’Nai B’Rith lodge, Anti-Defamation League and others. No one knows exactly what was discussed but less than a month later, President Kirchner dispatched special public prosecutor Alberto Nisman to meet with CIA and Mossad contacts in Washington. Upon his return to Argentina, Mr. Nisman – a militant Zionist – formally accused former Iranian President Ali Rafsanjani and seven of his cabinet members that included Ahmad Vahidi who would later become President Mahmoud Ahmadinejad’s defense minister of planning and financing the AMIA bombing through Hezbollah proxies. This news hit Argentine newspaper headlines big time, inspiring Rabbi Israel Singer, political director for the World Jewish Congress to “congratulate the Argentine Government” for making official its “accusation against Iran”, since that “confirmed the commitment made by president Kirchner during that meeting”. Argentina’s accusations, solely based on “intelligence” provided by the CIA and Mossad and their “car-bomb” theory, was promptly rejected by Iran. So, if the Iranians and Syrians did not conspire with Hezbollah and Hamas to carry out this attack, who really did then? Scenario 2 – Zionist In-fighting: An Israeli Link? The AMIA case takes on a whole new dimension when approached within the timeline of what was happening inside Israel in the early nineties. In 1991, the Madrid Palestinian-Israeli Peace Conference was formed which began moving forward fast after General Isaac Rabin won the June 1992 elections, making him Israeli Prime Minister. Rabin’s peace strategy required Israel to stop and dismantle illegal settlements by the ultra-right wing armed settlers movement, who claim that giving up even an inch of “sacred Israeli land” is outright treachery. Nevertheless, Rabin steamed on with the peace process and in September 1993 famously shook hands with Yasser Arafat in the White House Rose Garden with Bill Clinton’s blessing. Shortly after that, Rabin reached initial agreements with Syria over the Golan Heights and with Jordan. At the beginning of July 1994, Rabin allowed Arafat back into Palestine after a 27 year exile. Goldstein in turn was killed in the attack, but his tomb later became a place of pilgrimage for the Zionist Settlers Movement. It is within this timeline that, on July 18 1994, the AMIA bombing took place; at a very critical point in the internal fighting between rival Israeli and Zionist groups. But Rabin “did not get the message”. And so we reach the terrible climax of this sad story when on November 4, 1995 – little more than a year after the AMIA bombing in Argentina – Israeli Prime Minister Isaac Rabin was gunned down “JFK-style” on the streets of Tel-Aviv; not by a Muslim Fundamentalist, nor by a Palestinian terrorist, nor by a Neo-Nazi fanatic, but by one Ygal Amir: a young ultra-right wing Israeli student, member of the Zionist Settler’s movement and linked to Shin-Beth, Israel’s internal security service that was being revamped by Mr Rabin at the time. With Isaac Rabin assassinated and out of the way, Shimon Peres stayed on as lame-duck Prime Minister for seven months until elections in 1996 brought Benjamín Netanyahu and the Likud Party to power, and Labor was mostly swept out of Israeli politics. Then came Ehud Barack, Ariel Sharon, Ehud Olmert, and again today Netanyahu, showing that militant Zionism is fully at the helm in Israel. Today, as the US, Israel and the UK constantly threaten Iran with unilateral military attack, it appears President Cristina Kirchner – whether inspired by prudence or outright panic – has decided to “sit down and talk with Iran”. One wonders what will they be talking about? Little, no doubt: Argentina’s irrational and arbitrary accusations are shamefully unsustainable. What will the local and international Zionist organizations that wield so much power over Argentina, the US and elsewhere do about this? What will “The Embassies” in Buenos Aires (from the US and Israel, of course) do to bully Argentina? These are just some of the questions the AMIA case poses on the increasingly complex global grand chessboard in which Argentina has repeatedly and consistently mismanaged the AMIA case since 1994, all of which does not spell a bright future for Argentina. ­The statements, views and opinions expressed in this column are solely those of the author and do not necessarily represent those of RT. After anti-Muslim ads hit NYC subways last month, Jewish and Christian groups respond with a message of love – hanging pro-Muslim posters to condemn intolerance and celebrate the city’s diversity. Rabbis for Human Rights – North America and the Sojourners Christian group will place their adverts right next to the anti-jihad messagesthat were released by pro-Israel group, the American Freedom Defense Initiative (AFDI).The organization covered 10 Manhattan stations, despite strong objection by the city’s Metropolitan Transportation Authority. The original text by the AFDI declared "In any war between the civilized man and the savage, support the civilized man. Support Israel. Defeat Jihad." “Love your Muslim neighbors,” is the message on the Sojourners’ ad. “Our subway platforms and buses should not be the platform for messages of hate that divide friends, neighbors, and colleagues,” read a message on the Rabbis for Human Rights – North America’s website. “We needed to be present with a counter voice, we need to stand for the work of peace, and to say that free speech should not be used recklessly or in an inflammatory way,” United Methodist Women General Secretary, Harriett J. Olson, said during an interfaith press conference on Sept. 25th. Rabbis for Human Rights – North America has also called on New Yorkers to publicly condemn the executive director of the American Freedom Defense Initiative, Pamela Geller, for putting up the inflammatory anti-Muslim ads. “These disturbing and misguided ads are not meant to educate; they are meant to increase hatred and discrimination against New York City’s Muslims, and to drive a wedge between Muslims and Jews. The subway ads demonize Islam and ignore the positive contributions that our Muslim friends, neighbors and colleagues make to our country every day,” says a petition on its website. The anti-jihad ads went up in the subways late last month after a federal judge ruled that the city’s transportation authorities could not legally refuse to host the signs on the basis of "demeaning" language. The ads were apparently inspired by the violent protests that have engulfed the Muslim world over an American-produced amateur film ridiculing Prophet Muhammad. The AFDI is considered a hate group by the Southern Poverty Law Center watch group. It amazes me how one can take something as beautiful as that as just make it ugly. Wahhabis sure have some weird talents like that. Islam is the light baby sounded interesting. Searched that. Got weird non-viral video on youtube (6k hits). Dunno how they script the suggestions, but that just seemed odd to randomly pop up in suggestions. If the "truth" was "false", how would you describe "false"? The answer really ties into our purpose on this earth: were here to be tested, not nurtured. God didn't put us on earth to enjoy life w/out any hardships (that priviledge is for the afterlife). He puts these hardships not to punish you but to test you. Through hardships, our true selves come out. The veils we've created for ourselves are shattered when faced w/ hardship. Also, what make these things "evil"? Poverty makes us look for Allah (swt) and strength our bond w/ him. Disease makes us review our past and repent our sins. Miscarriages show us the importance of life and gives motivation to better ourselves. Every coin has 2 sides. You can't only look at the negatives. If life, we often find ourselves not doing things that we are obliged to do, such as chores, prayer, work, studying, etc. This is mostly due to the lack of motivation we have. Motivation is what drives us to do things we don't want to do. Of course, life isn't as simple as doing what we should do and not doing what we don't have to do. One cannot simply do something he doesn't want to do without motivation. It isn't logical. This puts us in a sort of dilemma. Where do we get motivation? What makes us pray, do chores, work, and study? If we should lack motivation, where would we look for it?